Scots is spoken in various dialects. The traditional Scots spelling conventions used here can, on the whole, be read and pronounced in any Scots dialect. For further guidance on the pronunciation of particular words check them in our dictionary. All dialects of Scots are easily understood by other Scots speakers. There is no such thing as a right or wrong dialect — all are equally valid. A standard written language is only necessary to avoid confusion and misunderstanding because with the written word, the signals and indicators that are relied upon in verbal face to face communication are missing . If all dialects of Scots were regularly heard on radio and television we would be as acquainted with them as we now are with Scouse, Brummy and Cockney. Unfortunately for us most programming decisions are made in London, by anglocentric English speakers. IPA phonetic symbols are used. The transcriptions are broad, capturing only enough aspects of a pronunciation to show how words differ from one another or where the pronunciation differs significantly between dialects. The IPA phonetic symbols are presented thus: Phonemes /x/ and words [røːz] (ruise). /ː/ indicates that the preceding vowel is long. /ˈ/ indicates that the following syllable is stressed. /ʔ/ represents a glottal stop. Graphemes (letter strings) are often represented thus: <ui>. Pronunciation examples are given in one or more of the following languages: Scottish Standard English, German or French. Scottish Standard English is Standard English spoken with a Scottish accent. Consonants usually have the same phonetic values (pronunciation) in Scots, as in Standard English. /r/ rat, is usually trilled (rolled) in Scots. The <x> in the prefix ex is usually /gz/ between unstressed and stressed vowels. Otherwise /ks/. *Most dialects of Scots have a German like Ich/Ach rule governing the pronunciation of <ch>. Pronounced /ç/ (Ger. Ich) initially or following a front vowel, and /x/ (Ger. Bach) following a back vowel. Here, /x/ is used for simplicity. Many speakers substitute a glottal stop /ʔ/ for /t/ and sometimes /k/ and /p/, between two vowels. The SVLR is most developed in the central Scots dialects, in peripheral dialects not all vowels are affected. The following vowels are usually long in stressed syllables before /v/, /ð/, /z/, /ʒ/ and /r/. **A morpheme is the smallest meaningful part into which a word can be divided, i.e. inflexions, prefixes and suffixes etc. /aɪ/ usually occurs in long environments. /əi/ usually occurs in short environments. In Scots the root syllable of native words is usually stressed, This root syllable is usually the first syllable of a word so there is often a tendency to stress the first syllable of foreign words, although many romance words retain their original stress. Many words have stressed (emphatic) and unstressed forms, especially pronouns, adverbs and some verbs. These are not usually indicated in writing. Some common spelling variations reflect the use of stressed an unstressed forms. These are indicated where they most commonly occur. along the Scots side of the border. Urban Scots refers to the dialects of Scots spoken in and around towns and cities especially Aberdeen, Dundee, Edinburgh and Glasgow. Although the Belfast dialect cannot be considered Scots it does include a number of features of Ulster Scots origin. Gàidhealtachd, the Gaelic for the Highlands and Islands to the west - were of course until recently on the whole Gaelic speaking. In areas along the highland line Gaelic influenced Scots can be heard. 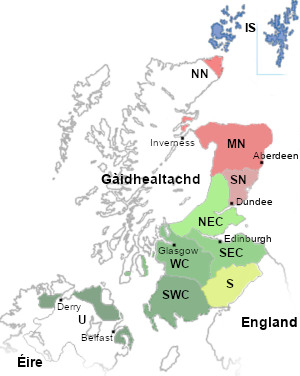 The southern extent of Scots can be identified on the basis of features which differentiate Scots from neighbouring English dialects, such as the pronunciation of come, the pronunciation /x/ where Standard English cognates have /f/ or /Ø/, the Scots pronunciation of <wh> as /ʍ/ as against English /w/ and where /r/ becomes the Northumbrian burr. Beat Glauser has also shown that most of the vocabulary of what are now considered Scots words have all but disappeared on the English side, while they are still in every day use on the Scottish side. For practical purposes the linguistic and political borders are almost identical. Dialects of course gradually pass into each other so that a mixture of dialects occurs where one dialect merges into another. A whole series of maps would be necessary to represent the distribution of sounds accurately. Only the main dialect differences between the areas mentioned are illustrated. The descriptions make no claim to be exhaustive. Many works have been written about and in local dialects. The local public library is a good source of such writings. Aitken, A. J. (1981) "The Scottish Vowel Length Rule" in Michael Benskin and M. L. Samuels eds. So Meny People, Longages and Tonges, Edinburgh. Glauser, Beat (1974) The Scottish-English Linguistic Border. Lexical Aspects, Bern: Francke. Jones, Charles ed. (1997) The Edinburgh History of the Scots Language, Edinburgh University Press. Murray, James (1870-72, 1873) The Dialect of the Southern Counties of Scotland, London: Philological Society. Grant, William and James Main Dixon (1921) Manual of Modern Scots, Cambridge University Press. Purves, David (1997, revised 2002) A Scots Grammar. Scots Grammar and Usage Edinburgh: The Saltire Society. Mather, James Y. and H. H. Speitel (1986) The Linguistic Atlas of Scotland volume 3 , London: Croom Helm.